To Curb Liver Risks, Johnson & Johnson Lowers Top Tylenol Doses : Shots - Health News Johnson & Johnson is lowering the maximum recommended dose for Extra Strenth Tylenol to six tablets a day from eight. Too much acetaminophen, the active ingredient in the painkiller, can cause liver damage. Johnson & Johnson is lowering the recommended top dose of Extra Strength Tylenol to reduce the risk of accidental overdose from acetaminophen. 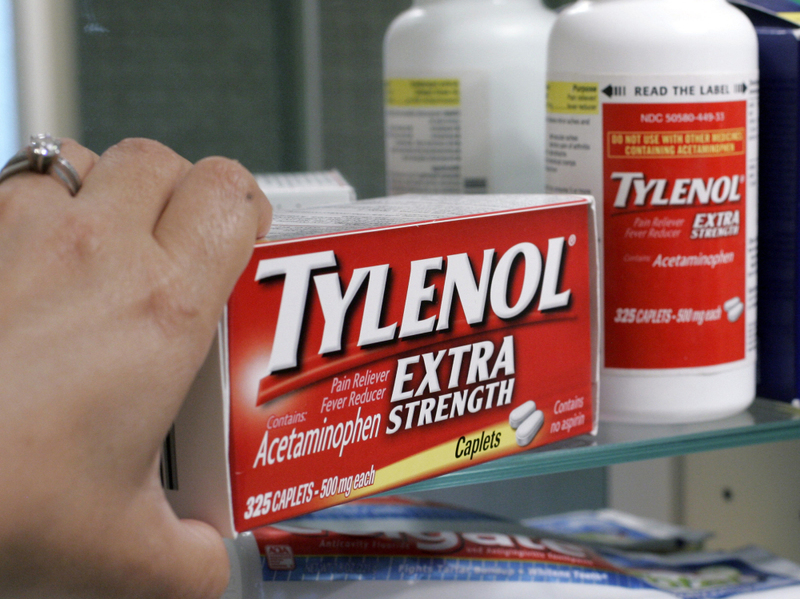 Too much acetaminophen, the active ingredient in Tylenol, can damage your liver or worse. Now to reduce the risk of accidental overdoses, Johnson & Johnson's McNeil division, marketer of the painkilling mainstay, is lowering the maximum dose for Extra Strenth Tylenol to six tablets a day from eight. Each of the pills packs 500 milligrams of acetaminophen, so the top recommended daily dose will become 3,000 milligrams instead of 4,000 milligrams. The company told the Food and Drug Administration it will change the instructions on Extra Strength Tylenol in the U.S. starting in the fall. Next year, J&J says it will also lower the maximum recommended doses for other medicines containing acetaminophen. How much acetaminophen is too much? Most people can handle 4,000 milligrams, or 4 grams, of the stuff a day. But it's easy to get too much if you take multiple medicines, such as a painkiller and cold remedy that both contain acetaminophen. Heavy use of alcohol — three or more drinks a day — can also raise the risk of liver trouble for people taking acetaminophen. Except for aspirin, most people don't know which active ingredient is in the over-the-counter painkillers they take, a recently published study funded by J&J found. Early this year, the FDA asked makers of prescription drug combinations that contain acetaminophen, such as Vicodin and Percocet, to cap it at 325 milligrams per pill, capsule or slurp of liquid medicine a person might take. The agency cited a study that found acetaminophen overdoses (about half of which were unintentional) accounted for more than 40 percent of cases of acute liver failure over a six-year period. In May, makers of over-the-counter medicines for kids agreed to stop producing infant-only liquid painkillers containing highly concentrated acetaminophen. Some drops contained as much as 80 milligrams of acetaminophen per milliliter. The new maximum is 32 milligrams per milliliter.